As with a lot of new technologies the real power comes from when they are used by the masses. Sender Policy Framework or SPF is no longer a new technology and is generally widely used to help preserve email domain reputation for large organisations, but is not as well-known about in the Small to Medium sized business end of the email market. Spammers know this and have started to target domains that do not have valid SPF records as they can most easily be used to spoof and send spam claiming to be from valid companies. Often these types of spoofed email are used in phishing attacks to then harvest more valuable data, so the more smaller companies that can adopt the use of SPF the better. In this guide I hope to explain in a simple way what SPF does, how it can be configured, and what real world considerations need to be made to insure it does not do more harm that good. The name Sender Policy Framework does give a clue to what SPF is all about. Its main role is to define a policy that controls who, or more specifically which servers are allowed to send email claiming to be from your domain. Without SPF any email that is sent using your domain has to be considered to be possibly valid, regardless of what server is sending it and this leads to large amounts of spoof email. Very bad news for large corporate organisations, but now a major concern for even the smallest companies that use their own email domain. By creating a Public SPF DNS record we can publicly announce which Internet servers are allowed to send email for our own specific domain. Lets look at this from a diagramatic point of view..
1. Sender claiming to be bob@mybank.co.uk opens an SMTP session to your mail server. 2. 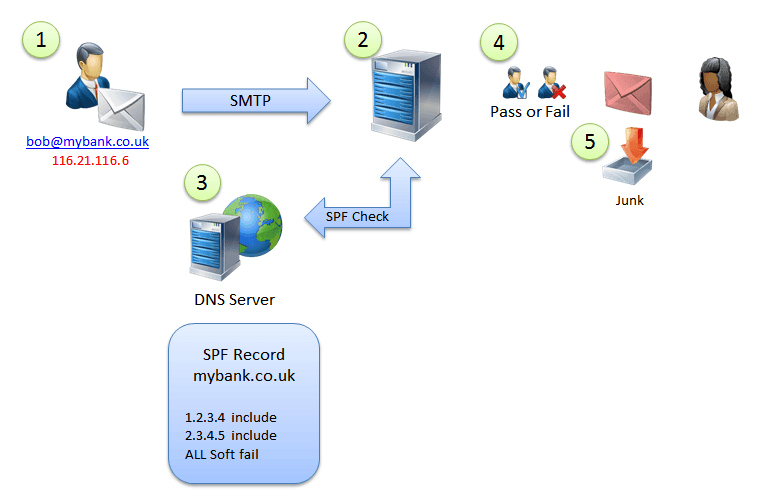 Before your mail server accepts the session it requests the SPF record for ‘mybank.co.uk’ from the DNS server. 3. The DNS server locates the SPF record for mydomain.co.uk via the DNS cloud and returns all valid sending servers and also what to do if a match is not found. 4. Your mail server uses this information to decide the sender is not allowed and follows the rule to ‘Soft Fail’ this message. It is still accepted and you tag it as spam. 5. The mail server is configured to put soft failed email into the users junk email folder. What does an SPF record look like and how is it created? A SPF record is line of text that lists the mail servers that pass or fail a request. The DNS record is therefore of type ‘txt’ and will look similar to this..
example.com. IN TXT "v=spf1 ip4:192.0.2.0/24 ip4:198.51.100.123 a -all"
The section between the quotes is the actual policy. example.com. IN TXT "v=spf1 mx -all"
…would only pass the listed MX records of a domain and all other servers would fail. In the above example we are issuing what is known as a Hard fail. This means that if the sending server is not on the allowed list then we want the receiving server to not accept the message at all. There is another option though. Instead we can return a ‘Soft fail’. The receiving server would then usually accept the message but tag it as ‘suspicious’ and warn the recipient. If you think you have already configured an SPF record on your domain this can quickly be checked using the windows nslookup command. This should show all text ‘txt’ domain records for a domain including any SPF records in the format show above. What Mail Servers should send valid email from your domain? Deciding what mail servers should send valid email for your domain sounds simple enough and definitely should include any local on premise servers like Exchange or MDaemon, but there may be more servers you need to add that you can often overlook. For example if you use any external email marketing solutions like ‘Mail Chimp’ these will often need to send valid mail using your domain and so if not added would fail any SPF checks. These types of services are aware of this issue and should be able to tell you what servers need adding to pass checks. This adds all servers as defined in the servers.mcsv.net record, so you can chain SPF records together for easier management and to get around problems with updating multiple records. As SPF records are DNS records the exact procedure does depend on the tools that your DNS provider provide to add and maintain domain records. From a technical point of view you need to create a domain ‘txt’ record on the root of your domain records, and the txt is a simple string as in the examples. Often you can edit records via a web interface and this should allow you to experiment, don’t forget you can always test the records using the ‘nslookup’ command as i have shown above. If your DNS provider does not provide a web interface to allow you manage your records you may have to contact them directly and request that a spf record is created, but as this is a widely used technology they should have experience of doing this before.